we're almost done with the leftover christmas cookies at our house. the end is now in sight. i swear, i don't know where they all come from! we made several different types of cookies this holiday, including: chocolate peppermint m&m's cookies, double gingersnap cookies, and mocha cookies. we also made a batch of cut-out cookies too. although these cookies look like sugar cookies, they're really more of a butter cookie. these cookies are not at sweet as traditional cut-out sugar cookies. they have a great almond flavor and a wonderful texture. they are so tender they just melt right in your mouth! this dough is soft enough that you could put it through a cookie press to make spritz cookies. however, you could roll it out to make cut-out cookies like we did. 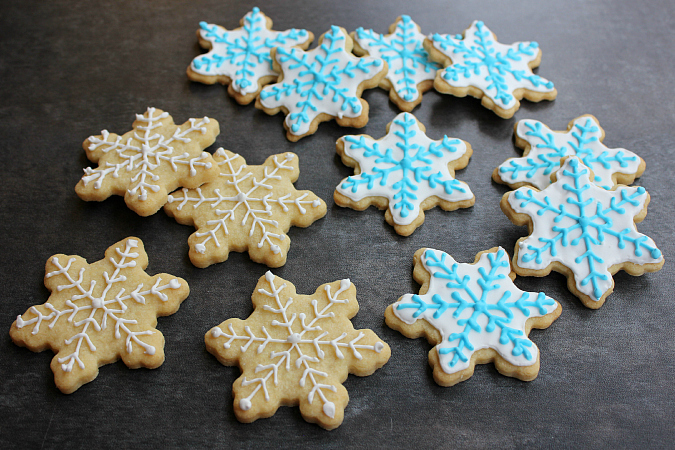 we cut our cookies in the shape of snowflakes and decorated them with royal icing. 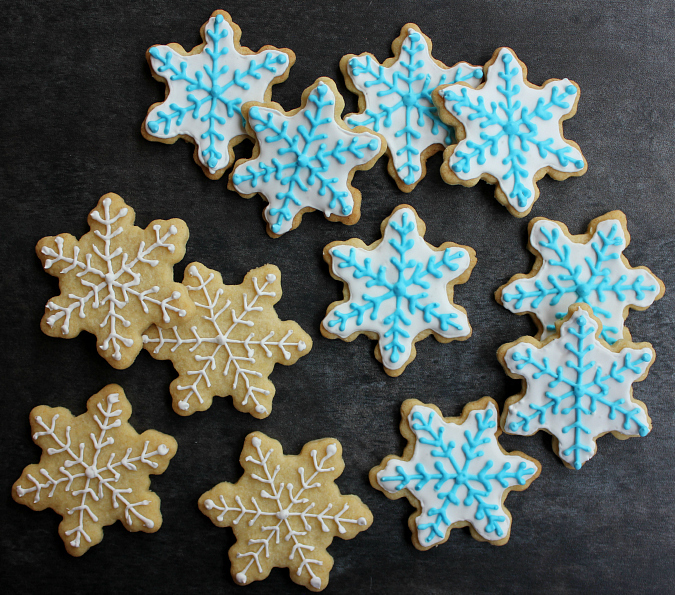 if royal icing isn't your cup of tea, you could leave these cookies plain or you could decorate them with sprinkles or colored sugar. this recipe is so simple and takes no time to make. the dough also does not need to be chilled before it is rolled out. nice and easy! preheat your oven to 350 degrees F and line a baking sheet with parchment paper. cream the butter in the bowl of an electric stand mixer fitted with a paddle attachment. add the sugar and beat well until light and fluffy (about 3 minutes). beat in the egg yolk, almond extract, and vanilla extract. in a separate bowl, sift together the flour and baking powder. gradually add the sifted flour mixture to the cookie dough. turn the dough out onto a floured surface and form it into a ball with your hands. roll the dough out with a rolling pin (about 1/4 inch thick) and cut it into shapes using cookie cutters. place the cut-out shapes onto the cookie sheet and bake for 10-12 minutes. once baked, allow the cookies to cool on the baking sheet for 5-10 minutes before transferring them to a wire rack to finish cooling completely. decorate as desired. The cookies look so pretty in the picture and they sure tasted good too.